Event Details: Join us in celebrating the retirement of Dr. Charles V. Shorten after 30 years of service to West Chester University. Time: 12:00 - 8:00 p.m. Event Details: Carnival rides, food trucks, games, giveaways and concert performance by American Authors! Time: 5 - 7 p.m. 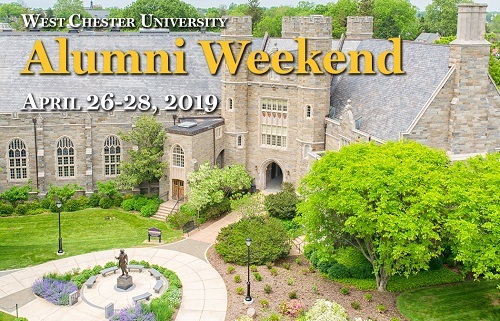 Event Details: Join WCU alumni and friends as we kickoff Alumni Weekend 2019! Heavy hors d'oeuvres, wine and beer are included in the ticket price. Time: 6 - 8:30 p.m. Event Details: Marking the 30th anniversary of the fall of the Berlin Wall, and featuring a range of artifacts including authentic pieces of the Berlin Wall, this exhibit examines the lived experiences of divided East and West Berliners, its symbolism and global impact, and its relevance today. A special lecture by Dr. Nikolai Vukov from the Bulgarian Academy of Sciences, coupled with a discussion with WCU faculty, complement the exhibit. Open to all alumni, faculty, and staff. Light refreshments will be served. About the show: You'll recognize the names and the stories will be familiar but nothing can prepare you and your family for the outrageous, wacky, and thoroughly joyful adaptation of Jon Scieszka and Lane Smith's beloved children's book The Stinky Cheese Man And Other Fairly Stupid Tales. Sure to be enjoyed by audiences of all ages, this theatrical work of kooky chaos runs headfirst into West Chester this spring. There will be music. There will be giants. There will be cowpies. Run, run as fast as you can and get your ticket to The Stinky Cheese Man. Click here for more info. Time: 9:00 - 10:00 a.m. Event Details: Join us for a free breakfast before the Annual Meeting! Event Details: Hear all the latest news from your Alumni Association and have coffee and conversation with our board members. Time: 10:00 a.m. - 2:00 p.m. Event Details: Sweep up the sidewalks of downtown West Chester with your neighbors and local businesses. Enjoy refreshments, lunch and enter to win Clean up Crew Contests! For full details and to sign up, click here! (Rain date: 4/28 1-5). Time: 12:00 - 4:00 p.m. Event Details: Come out to see the Senior Class Capstone Art Show! **If you are a prospective student, click here to visit the Admissions website for campus tour information. Event Details: Join President Fiorentino and our WCU Campus Community as we break ground on the SECC! The Sciences & Engineering Center and The Commons will be 175,000 square feet and the largest academic and service building on campus. Designed with a focus on student learning rather than conventional teaching, the building will house the departments of Health, Nursing, Nutrition and Physics as well as the newly approved Biomedical Engineering program. In addition, it will bridge academic and campus life by providing a student dining facility to accommodate the growing enrollment and flexible conference space to promote faculty and student collaboration. Click here for more information. Cost: $20; includes food buffet, domestic drafts, wine and well drinks. Event Details: Join us for our social and reconnect with your fellow Criminal Justice alumni! Cost: $10; includes heavy appetizers and cash bar. Event Details: Join us for our social and reconnect with Wrestling alumni! Time: 4:00 - 6:00 p.m. Cost: $25; includes appetizers and cash bar. Event Details: Join us to celebrate the 60th Anniversary of the Abbé Society! Time: 5:00 - 9:00 p.m. Event Details: Join us as we honor the 2019 Distinguished Alumni Award recipients: Tina Sloan Green '66, Henry Pearlberg '82 and Chip Smith '70, M'81. Time: 2:00 p.m. and 7:30 p.m.
Time: 10 a.m. - 1 p.m. Event Details: This year marks the 30th Anniversary of Kappa Delta Rho at West Chester University. This event will bring together alumni and families with undergraduate brothers to celebrate the rich history of our fraternity at WCU. Time: 1:00 - 3:00 p.m. Event Details: Join WCU Alumni & friends for and afternoon of painting and wine, hosted by WCU alumna Lindsay '15, where we'll paint a WCU keepsake! Event Details: Join us for the Inaugural WCU Alumni Golf Outing in support of the Chester County Alumni Chapter Scholarship! Friday, April 26: 8:00 a.m. - 4:00 p.m.
Saturday, April 27: 11:00 a.m. - 3:00 p.m.
Sunday, April 28: 11:00 a.m. - 3:00 p.m.
© 2019 West Chester University Alumni Association. All Rights Reserved.